Special Report: Whatever Happened To Common Sense? It boggles the mind. Honestly it does. Today's computer keyboard was designed by those who don't type, much less touch-type. Most desks offered for computers, are not compatible with computers. The original mouse design which should have been immediately reworked, was instead perpetuated by copycat companies with limited engineering talent. The executive who OK'd the touchpad located at bottom-center on the newer notebook computers clearly had his brain on hold. 1873 - "The first practical typewriter and the first woman typist..." Remington, on the fiftieth anniversary of the typewriter in 1923. Above: Inventor Sholes daughter. A little harsh? Yes, and for good reason. This time, thousands upon thousands of people are being physically injured by this type of design stupidity. Manufacturers, if you don't know what you're doing, then please get someone who does. For Pete's sake, don't just go into production and saddle the rest of us with your mistakes. We're especially exasperated with everybody and his brother slapping that overworked term "ergonomic" on every bad design on the market, in an attempt to encourage you to throw away your hard-earned money. No, this is not an invitation for some jerk to file a lawsuit. Instead, think of it as a challenge to the engineers of the world to step in and force their companies to start employing some common sense in product design for a change. Displayed at left is a picture of the Underwood No. 5, the most successful typewriter design in history. Appearing shortly before 1900, the Underwood established the stereotype of a typewriter that lasted until the introduction of the hugely popular IBM Selectric typewriter (shown at right) in 1961. (IBM introduced the electric typewriter in 1933). Pay particular attention to both the keyboard and spacebar size and positioning used on these machines. Both were considered exceptionally fast and user-friendly machines for typists. When the Underwood was first introduced, it was only one of hundreds of competing and extremely varied typewriter designs. But by 1920, almost every typewriter imitated the Underwood. It used the practical (mechanically speaking, that is) QWERTY keyboard. This seemingly awkward arrangement of letters was formally introduced on the "Sholes & Glidden Type Writer," (produced by the gunmakers E. Remington & Sons in Ilion, NY from 1874-1878) . The keyboard layout was a carefully thought-through rework of the original design, for the purpose of preventing typewriter keys jamming, and thus, to facilitate faster typing speeds. Interestingly enough, the keyboard design and physical spacing of the keys turned out to work very well indeed, and not just mechanically . Many early typewriter manufacturers introduced competing keyboard arrangements, but the QWERTY layout won out, because the public, although originally bewailing the layout, found it to be remarkably user-friendly. They promptly accepted and embraced it. Subsequent typewriter manufacturers did not to attempt to introduce a different arrangement, wisely following the common sense adage "If it ain't broke....."
Millions of these typewriters were used by secretaries, journalists, government officials, and writers throughout the first three quarters of the twentieth century. These individuals (and virtually all of today's business support staff) were trained with the touch-typing method. Why? Because it's enormously faster and more efficient than the hunt and peck method, and it radically reduces typing errors inherant to hunt and peck documents. A short, inexpensive typing course permitted the typist to memorize key placement so that there was no need to go back and forth, making error after error. The typist never takes his/her eyes off the document being typed. (Think of it like placing an automobile on cruisecontrol. You simply watch where you're going, everything else is automatic.) This method also required typists to make certain their bodies were properly positioned. Sit up straight, feet on the floor, forearms and wrists level, with fingers lightly touching the (properly designed) keyboard. You didn't even begin to hear of typing injuries until the computer keyboard came out, did you?. With the advent of the computer age, the majority of the "professional population" (uh...we were trying to avoid singling out males here) suddenly found themselves at a tactical disadvantage. 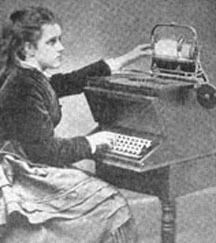 Instead of being assigned a secretary to do their typing for them, they were issued a computer, along with instructions to do their own typing. The result was fairly predictable. Pop Quiz: OK guys, how many of us actually pull into a gas station to ask directions when we're lost ? Nearly an entire generation, either too embarrassed, or too stubborn to learn how to type, chose to rely on the inferior hunt and peck method of typing, instead of simply taking a course to learn how to do it right. To be fair, it clearly should have been the company's responsibility to provide their employees with the training they needed to operate the equipment properly. It was the equivalent of issuing a car without driving lessons. A failure on the part of employers to provide the necessary touch-typing training (and now practical ergonomics training as well) continues to cost business and industry millions of dollars in lost employee productivity, to say nothing of insurance bills to repair the resultant medical damage inept product designers have wrought upon the rest of us. Because, from this same logic-impaired group come the designers of the computer keyboard (and mouse) in all their current incarnations. This is what happens when people try to design something they themselves don't know anything about, without bothering doing their homework first. Seriously, is it any wonder we currently have so many computer typing injuries? You don't design products which make allowances for and foster ignorance, instead you train perfectly bright people to design and DO things properly. That way you don't have unnecessary injuries. Touch-typing classes were formerly an elective. Today however, touch-typing is becoming a mandatory part of school curriculum. And for very good reason. It's like driver's education for students. If we don't train them, and if we don't provide safe equipment for them to use to begin with, somebody's likely to get hurt. The biggest ergonomic FUBAR of course, was the introduction of the mouse. From a utility standpoint, it was great. From a practical product design standpoint, however, it has been a disaster. It requires a user to grasp an unnecessarily over-sized object for several hours at a time, holding it at a 2 o'clock angle, and using the exact same claw-like position one would assume to grasp and pitch a large rock. The 2 o'clock position of the mouse in use for hours at a time, is sheer torture on both forearm and elbow. Drop your hands to your side. Notice the position of the thumb and forefinger. Close together, aren't they? Now rest your hands on your desktop or keyboard tray. The thumb and forefinger are still close together, aren't they? Now try grasping the mouse, on its mousepad, at the side of your keyboard, and watch what happens to your thumb, your forefinger, and your little finger. That's an unnatural position for both your hand, your wrist, and your arm. Remembers writers cramp? The original typewriter keyboard successfully eliminated the cramping and strain of writing for hours on end with a pencil or pen. The deadly combination of today's poorly designed computer keyboard and mouse, on the other hand, has compounded hand and muscle strain to the 'nth degree. The introduction of the keyboard-mounted touchpad/glidepoint/trackball held real promise. Until it fell into the hands of keyboard designers who don't know how to type, and are clearly devoid of common sense, that is. The three-inch supposed "wrist-rest" design now being incorporated into laptops and notebooks badly hinders typing. Far from acting like a carpal-rest, it forces the typist to un-naturally elevate and arch the wrists, simply to get TO the keys in the first place. More astounding than this, however, is the sheer idiocy of placing either a trackball or a touchpad immediately beneath the natural thumb-rest area. Because of the placement, you can't help but accidentally touch the screen or ball, so whatever it is that you're working on is sent zooming, either across the screen, or into never-never land. Clearly, nobody bothered to do field-tests. What on earth is the matter with these companies? Manufacturers, your customers are howling in frustration. Here's the crux of the problem; One company comes out with a stupid design, and immediately, others, assuming the first is really on to something, rush like mindless lemmings to follow suit, without first bothering to conduct their own research. It's a vicious cycle, perpetuating bad design. Worse, it now perpetuates injury. The so-called "ergonomic keyboard", (you know, the one with the split design), also looked interesting. For about five minutes. Until you actually sit down and tried to type something with it. Guess what? Yet another typing product designed by people who don't type. Attention Manufacturers: The letter "B", key is customarily activated by the right index finger. That's because for right-handers (who are the majority of computer users) it actually represents a muscle strain for the less-flexible left index finger, just to reach it. (go ahead, try it) But the manufacturers of the split keyboard cleverly placed that key on the left half of the divided keyboard. Other manufacturers simply copied the design. How's that for the ultimate domino effect in irresponsible manufacturing? Nobody did their homework. Here's a common-sense suggestion for consumers. Before you even THINK about purchasing either a computer, or some off-the-wall "special" keyboard for that matter, go rent one and try to actually work on it for a weekend. You'll be enormously glad that you did. We saw one keyboard, for example, priced at $175. that was not only split, it was shaped like the bottom half of a steel drum. Its' manufacturers were insisting that users should begin using an alternative key layout. (Less intellectually astute lemmings were rushing to copy this design without stopping to consider that half the population tend to wear their fingernails long, and women are in the majority when it comes to using computers.) (And it was a lame design to begin with). Here's a hint, manufacturers. Go back to basics. It's the keyboard layout, stupid. Thumbs activate the spacebar. So put the spacebar underneath the thumbs. Bottom line, do NOT buy products you or your company will end up hating. Do your homework. And then take a moment to drop a note to the manufacturer to tell them exactly WHY it is that you're NOT going to buy their products. Address it to the Chairman of the Board. Maybe he's paying attention. Nobody else is. Do we have a suggestion for manufacturers of PC keyboards? Sure. Actually there are several options that will work equally well. Go back and take a good hard look at the keyboard on the old IBM Selectric typewriters. Then take a look at a standard computer keyboard. See the difference in key placement? OK, now spread your keys out so that they're in the right place. Next, take all the nifty little up-down and delete keys and your nice little light bar, and get them the heck out of the way. Move your entire number pad to the upper right of the instrument, and use that blank space for a built-in touch pad or trackball pad, or pen-stylus, whichever you're using now. (People will eventually decide which one they prefer). Bury that fat, long-tailed mouse altogether. The key at this point is to put things where they make sense. Customers don't want mousing controls under their thumbs, that's a thoroughly bad design, gentlemen. If you'd done YOUR homework we wouldn't have to tell you this. Put the mousing controls on the right side of the keyboard, conveniently accessible, but not in the way. Common sense, guys. Common Sense. Yes, we're available for consulting. But you've got perfectly good minds already on staff. Try using them for a change. for common sense keyboard design. was first off the mark with this ergonomic solution. Nice work, guys!. Has YOUR company got a better keyboard/mousing solution? What about a kids version? Do use the old IBM Selectric as a guide. APC's engineers accepted our challenge. Compact 17" keyboard is part of APC's NetShelter line. PRODUCT INFO: APC's 17" Keyboard (16.3" x 7.6") comes with 104 high quality mechanical key switches and a separate, integrated number pad. A touchpad is provided for easy mouse/pointer usage, eliminating the need for an external mouse or clumsy trackball design. Dual PS/2 connectors for the keyboard and touchpad are provided. Selecting Products or Services for yourself or for your company? HOME OFFICE MALL reminds you to ....Do Your Homework First! Article Reprint Courtesy of : The Summerland Group, Inc. Specialists in Common Sense Engineering.